An anaerobic organism may be unicellular (e.g. protozoans, bacteria) or multicellular. For practical purposes, there are three categories of anaerobe: obligate anaerobes, which are harmed by the presence of oxygen; aerotolerant organisms, which cannot use oxygen for growth but tolerate its presence; and facultative anaerobes, which can grow without oxygen but use oxygen if it is present. Obligate anaerobes, which are harmed by the presence of oxygen. Complex multicellular life that does not need oxygen is said to be rare, however there are examples of such organisms. At least three species have been discovered in the hypersaline anoxic L'Atalante basin at the bottom of the Mediterranean Sea in 2010, metabolizing with hydrogen, lacking mitochondria and instead using hydrogenosomes. ↑ Upcroft P, Upcroft JA. "Drug Targets and Mechanisms of Resistance in": 150–164. doi:10.1128/CMR.14.1.150-164.2001. PMC 88967 . PMID 11148007. ↑ Levinson, W. (2010). Review of Medical Microbiology and Immunology (11th ed.). McGraw-Hill. pp. 91–93. ISBN 978-0-07-174268-9. 1 2 Danovaro R; Dell'anno A; Pusceddu A; Gambi C; et al. (April 2010). 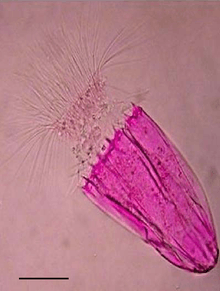 "The first metazoa living in permanently anoxic conditions". BMC Biology. 8 (1): 30. doi:10.1186/1741-7007-8-30. PMC 2907586 . PMID 20370908. ↑ Gest, Howard. (2004) The discovery of microorganisms by Robert Hooke and Antoni van Leeuwenhoek, Fellows of the Royal Society, in: 'The Royal Society May 2004 Volume: 58 Issue: 2: pp. 12. ↑ Prescott LM, Harley JP, Klein DA (1996). Microbiology (3rd ed.). Wm. C. Brown Publishers. pp. 130–131. ISBN 0-697-29390-4. ↑ Brooks GF, Carroll KC, Butel JS, Morse SA (2007). Jawetz, Melnick & Adelberg's Medical Microbiology (24th ed.). McGraw Hill. pp. 307–312. ISBN 0-07-128735-3. 1 2 3 Hogg, S. (2005). Essential Microbiology (1st ed.). Wiley. pp. 99–100. ISBN 0-471-49754-1. ↑ Pommerville, Jeffrey (2010). Alcamo's Fundamentals of Microbiology. Jones and Bartlett Publishers. p. 177. ISBN 9781449655822. ↑ Slonim, Anthony; Pollack, Murray (2006). Pediatric Critical Care Medicine. Lippincott Williams & Wilkins. p. 130. ISBN 9780781794695. ↑ Schöttler, U. (November 30, 1979). "On the Anaerobic Metabolism of Three Species of Nereis (Annelida)" (PDF). Marine Ecology Progress Series. 1: 249–54. doi:10.3354/meps001249. ISSN 1616-1599. Retrieved February 14, 2010. ↑ Roberts, Larry S.; John Janovay (2005). Foundations of Parasitology (7th ed.). New York: McGraw-Hill. pp. 405–407.